When you think about it, spring is always just around the corner. But say that to somebody digging their car out of a 4-foot snowdrift in January, and you might not get the cheerful response you expected! That's what makes this Little Spring Bunny Costume so great. It's an adorable outfit that will help you and your child bring joy to others in any season! 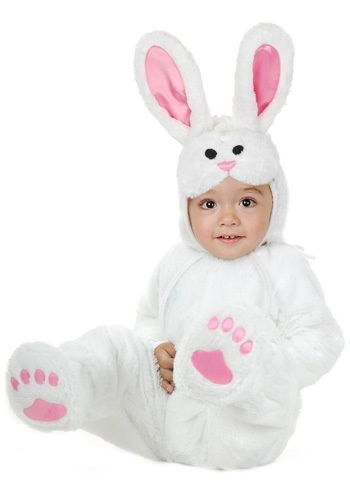 Liven up an Easter get-together with friends an family by dressing your infant or toddler in this hippity white rabbit jumpsuit and hoppity hood and booties. Or wear it while trick-or-treating to remind everyone that April showers and May flowers wait for them on the other side of the ice and snow to come! Plus, there are brightly-colored Easter eggs to look forward to! The playful bunny head hood and paws are sure to draw a few smiles, but this outfit isn't just about looks. The snuggly microfiber faux fur and gentle wrist and ankle cuffs of this outfit will help ensure that even sensitive or squirrely young ones can share in the fun. In addition, newborn & infant sizes have inseam snaps for diaper access. We find that the holidays are best when everybody feels comfortable and can celebrate in the way that makes the most sense to them. So if you know of someone who feels like getting in the swing of spring, but isn't quite ready to enter the cutthroat world of egg hunting, this cute costume is tops!